Together with a special tribute to PATRICK TROUGHTON (the Second Doctor), containing messages from a host of stars and production staff from DOCTOR WHO, this DVD also features the best in-depth interviews ever undertaken with, ANNEKE WILLS (Polly), MICHAEL CRAZE (Ben), FRAZER HINES (Jamie), DEBORAH WATLING (Victoria) and WENDY PADBURY (Zoe)! For all DOCTOR Who fans, this 2 DISC special collectors' edition is 5 hours of pure nostalgia, which will give you a whole new insight into the making of your favourite science fiction series! This is a multi-region DVD that plays in all territories. Worth it for the Michael Craze interview alone. I do like the concept of this sort of release. I watch wrestling "shoot interviews" at times where wrestlers and wrestling personalities, some of them retired, speak about their careers. I wish there was a comic equivalent of these sorts of releases, particularly if our host was one of the interview subjects. I should first declare my interest here: I directed the Anneke Wills interview, edited Deborah Watling and performed various roles on all the others. I think it's a great set. 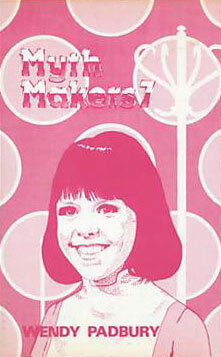 These are repacked MythMakers programmes which began in the mid-80s. The original 30 minute tapes were sold on VHS via mail order. I used to go round to Keith Barnfather's house and help him mail them out (Keith has the distinction of being the organiser of the first ever Doctor Who convention in 1977). I even did the artwork for some of the early covers! As they became more successful the running time increased to 50 minutes and in the nineties new interviews were conducted with Michael Craze, Debbie Watling and Wendy Padbury which were edited in with the originals. Koch Media have produced similar sets for Hartnell, Pertwee and Tom Baker. There's not really enough material for a McCoy set as there's only Sylvester and Sophie Aldred (Keith hasn't done a Bonnie Langford interview yet). Same applies to Colin Baker as there's only him and Nicola Bryant. Thanks for the link, Robbie. Are these the raw, full interviews from the Doctors documentary series that BBC ran for the 50th anniversary, or are these brand new? Patrick Troughton Tribute (2002) - contains Troughton's appearance at PanoptiCon V in Brighton (1985) along with new interviews featuring various actors and production staff. These had been shot over a number of years as the opportunity arose. Unfortunately the convention footage of Troughton is not particularly good quality but this was his only UK convention appearance apart from the BBC Longleat event in 1983. Michael Craze. (1996) The original interview was shot in 1985 at the Norfolk bar where Craze was working at the time. A new interview was conducted in the studio in the mid-90s (where material for the Troughton tribute was also recorded). The current edition combines footage from both interviews. Anneke Wills. (1993) We shot this in Norfolk in 1993. By this time the standard length of the tapes was 50 minutes. Deborah Watling. (1995) - The original tape was shot at a convention in Liverpool in 1986 and a second interview was conducted in 1995 during production of the drama spin-off Downtime. Fraser Hines. (1994). Filmed in Yorkshire at Fraser's home. Wendy Padbury. (1994) The original was shot at the Cardiff theatre where Wendy was appearing in Super Ted. As with Michael Craze, the second interview was recorded in the studio in the mid-90s. Here you go Robbie: The Doctors - The Sylvester McCoy Years. The McCoy interview is from 1994. We filmed it on location at Rutland Water where Battlefield was shot. Sophie Aldred also features as a production assistant. The idea was to do it all in one take as Nick Briggs and Sylvester walked and talked but we had to stop twice due to technical problems. I was also a production assistant on the day but didn't get as much screen time as Sophie! I also provided some basic computer graphics done on my work's Commodore Amiga! The Sophie interview is from 1991 and has Sophie driving Nick around Blackheath visiting various places from her childhood. I was production assistant again, which mainly involved driving producer Keith Barnfather around as we followed Sophie! I also provided some graphics for this one. I'm not entirely sure the idea worked but it was what I was asked for! Jessica (The Greatest Show in the Galaxy) Martin, interviewed by Sophie Aldred in 2016. Angela (Battlefield) Bruce who was interviewed last week at Rutland Water by Sophie (her again! ).